During this 4 Week Situational Awareness Class you will learn the best places to park in a parking lot and how to navigate parking lots safely. Are you concerned about the recent rise in violent encounters in the US? Do you ever feel vulnerable while walking to your car? Do you know what to do in the event of a gunman, flash mob or natural disaster? Do you have the mindset to survive an attack or violent encounter? DAT has developed our Situational Awareness class to give you the tools to navigate through these and many other current, real-world safety issues. The course will combine classroom instruction, off-site situational awareness demonstration, and practical real-world self-defense techniques. At Direct Action Tactical we believe that being prepared frees you from being paranoid. 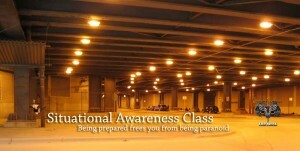 Join us for our Situational Awareness Class so you can be better prepared for the changing would we live in. Self Defense begins with knowledge. No upcoming courses posted. Please check back soon to see what is available.